Ashley Stott heads in the only goal of the game in our FA trophy tie against Sutton Coldfield Town. 22-Sep-2010 PRESCOT CABLES 3-1 247 MacPHERSON STOTT KINSEY -p.
16-Oct-2010 Cammell Laird (FAT 1q.) 2-1 140 KINSEY -2,1p. 20-Oct-2010 CAMMELL LAIRD 3-0 231 STOTT -2 HARRISON B. 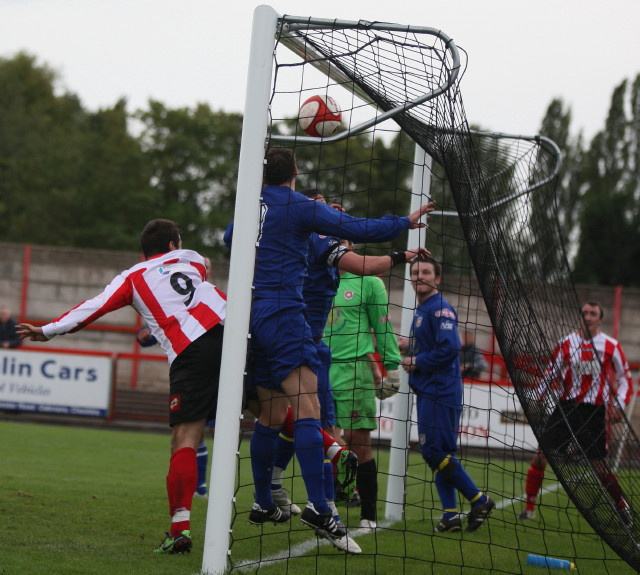 30-Oct-2010 Radcliffe Borough (FAT 2q.) 1-1 193 KINSEY -p.
12-Feb-2011 MOSSLEY 2-0 256 HARRISON J. DOUGHTY -p.
5-Mar-2011 WOODLEY SPORTS 2-2 240 KINSEY HARRISON B. 29-Apr-2011 DURHAM CITY 1-1 285 KINSEY -p.